We changed venue this time as GG had just spent several weekends installing a fantastic new bench in his, rearranging the layout and generally making his shed ‘the place to be seen’! 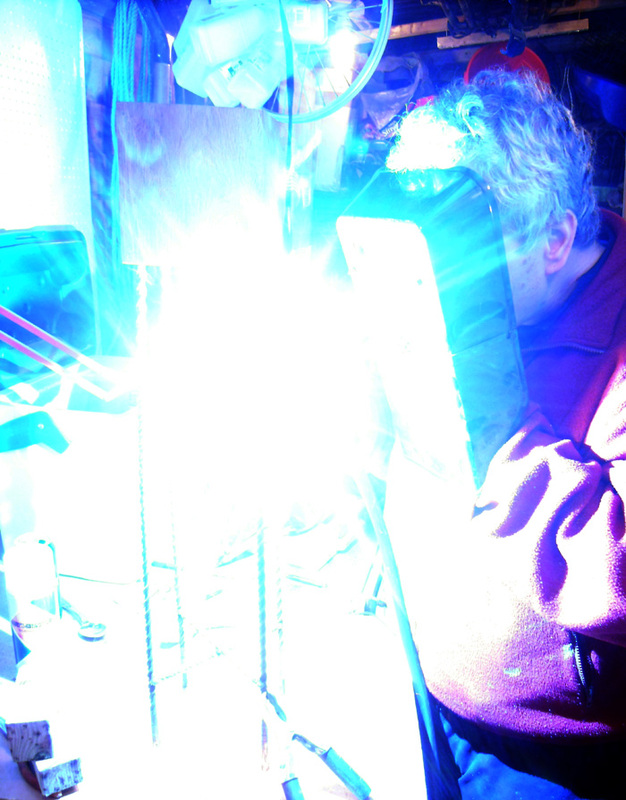 He had also just got a very posh new MIG welder for his birthday, so I was keen to give that a go. Armed with the usual apparatus (warm clothes, safety goggles, a cooler of beer and the promise of fatty take-away food when we were done! ), we set to. . . I also had a specific project in mind – the creation of a welded set of legs atop of which would sit a wooden block candle holder I had recent purchased for £2 in my local charity shop. Here’s a WIP shot, more on my Flikr site here >>. Look out for Shed Night III (This Time It’s Personal), coming soon to a shed near you. . .! November 5th in the UK always gives me a legitimate excuse to have a stinky bonfire and burn things!! 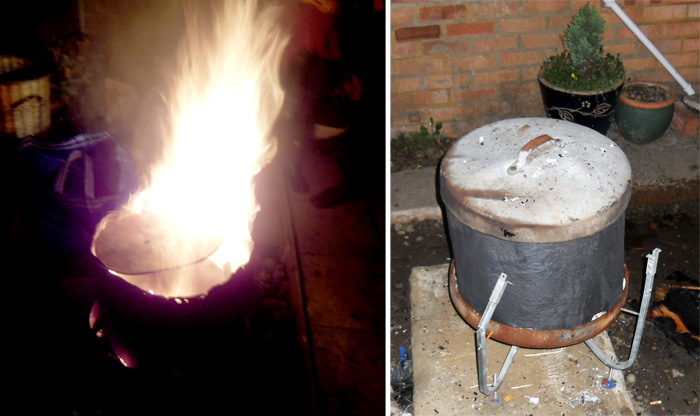 If anyone recalls an earlier post about me re-vamping my trusty copper half-cistern and dustbin lid garden bonfire, here it is in action on this year’s Bonfire Night. The improvements I made back then have been really successful, and it’s now even got a new lid (courtesy of a second metal dustbin lid), ideal for keeping the rain off or to let the last of the embers safely burn themselves out. I never did get around to burning the filigree into the upper regions, but there is always time before next year, I guess! 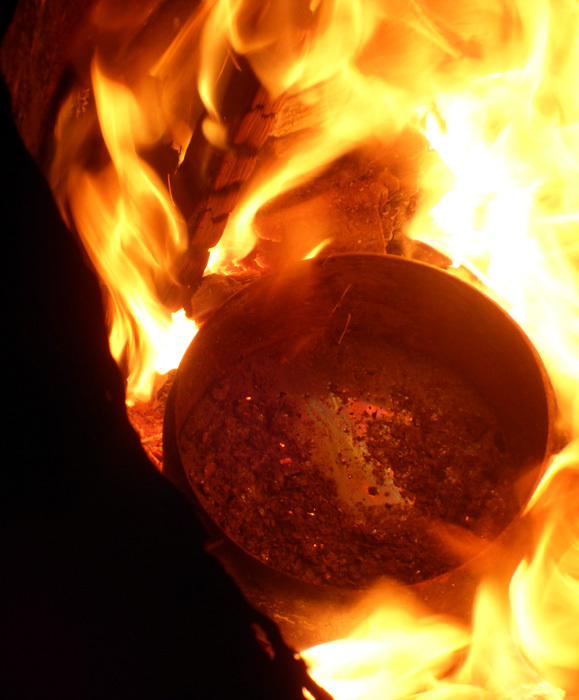 I love this shot of some lead melting in an old saucepan – what doesn’t show very well in the photo is that the metal of the old saucepan itself was glowing red! 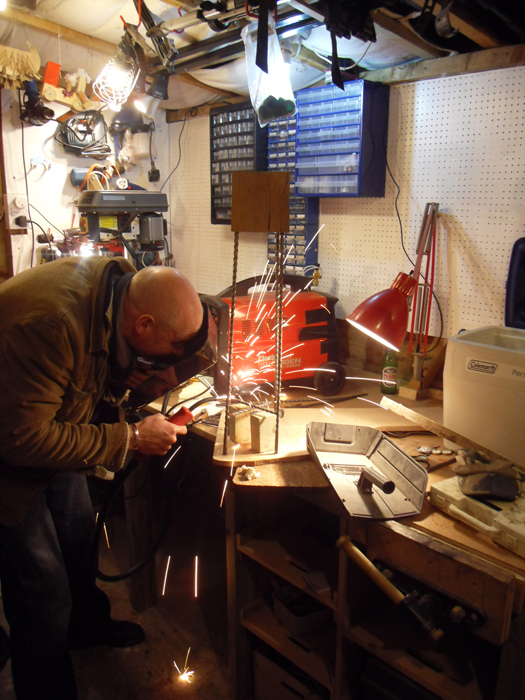 I’m always amazed how hot the burner gets… The lead was then ladled out and used to fill in the base of my latest steampunk lamp (full details to follow when it’s completed). In the meantime, here are some (upside-down) shots of the lamp base being constructed – the smaller top part partially filled with lead to hold the copper tube shaft in place (left), with the larger second part screwed over this (see the copper shaft protruding through and the larger hole I’ve cut to allow the lead to flow between the two sections (middle), and a final shot of the lead having been poured in and set in place (right). Here’s my favourite result from the night however… I had an old saw (found, as always, in a skip) that had a broken wooden handle. Rather than trying to unscrew the thoroughly rusted screws affixing the two parts, I thought I’d simply burn the wood off in the burner. 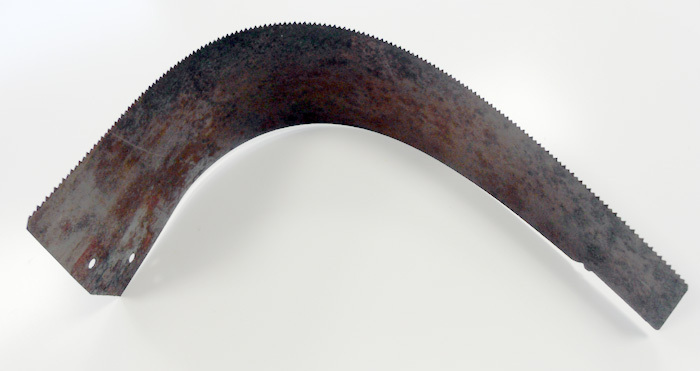 What I hadn’t banked on was the saw blade bending in the heat into a lovely subtle curve. When cooled it has, amazingly, lost none of its springiness! Given a coat of spray varnish to protect the rusty patina (it’s actually a lot darker than this photo shows but I had to push the Levels up a bit on order to show the blade off properly). So now, what to do with it? It looks great as just an ornament, or would look wonderful mounted on some sort of pole in a upright position as a bit of minimalist sculpture. My favourite idea at the mo’ is to mount it on a wall at 90 degrees on its side, sticking out as some kind of artistic ‘shelf’ . Will see how that works and post some shots up . In the meantime, if anyone has any other ideas, please let me know! 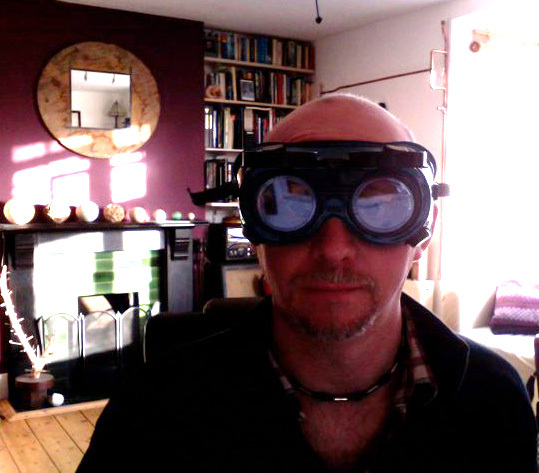 Rather than a niche fashion accessory however, these are Gas Welding Goggles, of a Shade 5 strength. As such they may not offer enough protection for my general arc welding (I think around Shade 8 or so are recommended for that purpose?) but as general safety goggles seem most excellent! Not only do they secure firmly around the head (leaving both hands free for general tasks), they have built in ventilation slots to prevent fogging and, best of all, you can flip the dark shades up to reveal the plain glass lenses for when you need to see normally. I tried wearing them around the office the day she gave them to me – not only did I look particularly cool, but I discovered that the whole world seems a much calmer/less stressful place when in near total darkness!! Never throw anything away. . .
. . . because you never know when it is going to come in handy!? 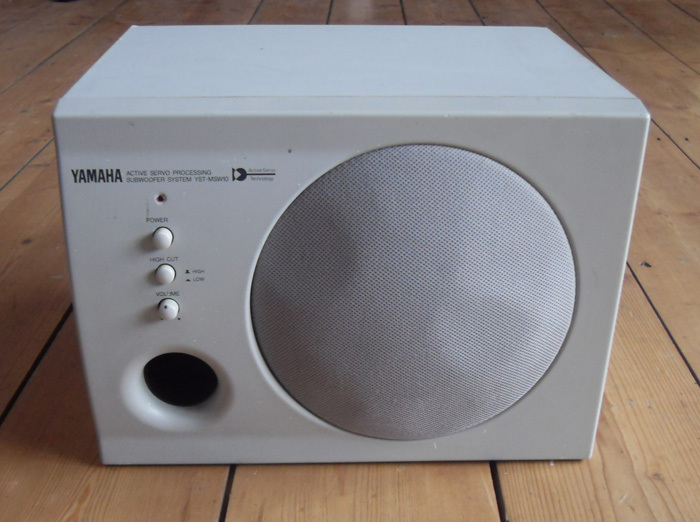 Years ago a friend of mine into IT gave me an old Yamaha Sub woofer unit from a set of PC speakers. 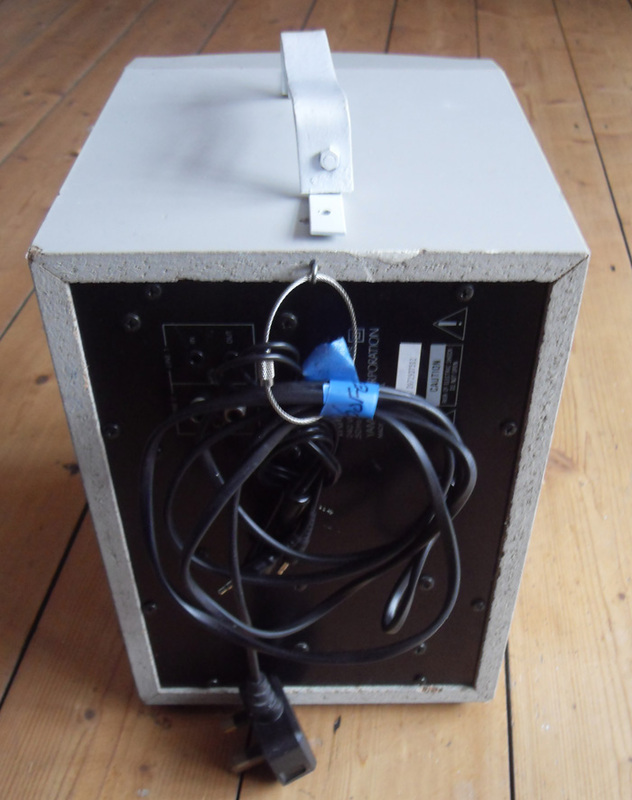 I’d never used it, had none of the right cables, none of the accompanying speakers and, if truth be told, no real use for it either. I’d finally consigned it to the loft a few years ago, and during a recent futile attempt to de-clutter my life, had even contemplated simply taking it apart for ‘bits’, giving it to the local Freecycle site or even, heaven forbid, sending it to the local tip (scandalous!). . . Then, something happened (stick with me on this one). . .
A couple of weekends ago I did a little gig at the excellent Hitchin Folk Club (winner of 2005 Folk Club of the Year, no less!) with Navaro, supporting Little Johnny England. We’d done a sound check, sat around for a bit, and then decided that we should use the intervening time wisely by having a quick run thought of some newish material we were doing that night. The rest of the band were all ok for doing this (they had acoustic guitars, their voices and even a tambourine!) – I on the other hand (playing as I do in that band a solid body electic bass guitar, completely inaudible without some sort of amplification), realised that I had absolutely no way of playing along with them / being heard (band bass amp being already set/miked up on stage and hence unmovable). The only way I managed to play along with them at all was to rest my front teeth on the upper bout of the guitar body so that I could ‘feel’ the notes (a bit like the feeling one gets if you hold a tuning fork in your teeth!). Not only are my teeth getting too old for that sort of thing, it looked ridiculous, gave me a pain in the neck / back and was clearly a waste of time for the others. What I need, I thought to myself, is a tiny little amp capable of being carried anywhere at will (just in case it’s needed), which doesn’t need to be too loud, yet can handle bass frequencies without shaking itself to bits. Eureka! 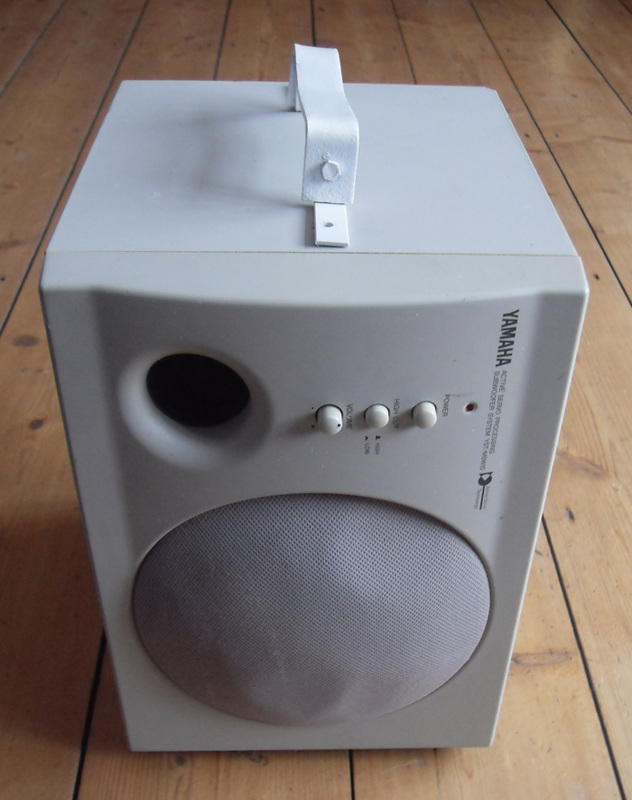 Enter the redundant bass woofer unit – essentially no more than a purpose-built solid box, with its own little built-in amp and a sturdy bass-friendly speaker – it even has a little bass reflex tube for added bottom end! With a quick bit of modding (I added some feed on the side so that it can be stood and carried in a more space-saving upright position, made a handle out of some old bits of cast off metal, soldered together a lead to allow a standard guitar jack lead to plugged on to the thing and voila! It’s never going to make an appearance on a stadium stage, but as a portable, ‘go-anywhere and simply be heard for rehearsing’ amp, it does the job. And more importantly, it’s now put to good use rather than adding to landfill! The new 'Bass Amp' woofer!